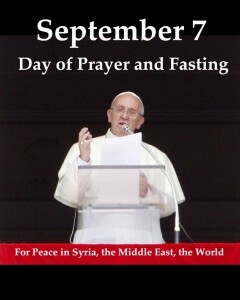 Just before the Angelus of 1 September, His Holiness Pope Francis announced his decision to proclaim next Saturday, 7 September, “the vigil of the birth of Mary, Queen of Peace, a day of fasting and prayer for peace in Syria, the Middle East, and throughout the world.” The Holy Father invited “each person, including our fellow Christians, followers of other religions and all men of good will, to participate, in whatever way they can, in this initiative.” He also condemned the use of chemical weapons, calling on us all to get involved in working for peace. We call upon all our priests to open their churches during that period to pray with any parishioners who manage to come. This vigil will be marked by the celebration of Vespers and Matins with a time of prayer and meditation. The prayer uttered by Blessed John Paul II at Quneitra on 1 May 2001 should also be recited. We also suggest reading Pope Francis’ remarks of 25 August and 1 September as well as our own statements and appeals for peace. The collections taken during this prayer vigil and the next day, Sunday, will be entirely for the benefit of Syria’s crisis victims in need and distress.